I have a special parenting article for you today! 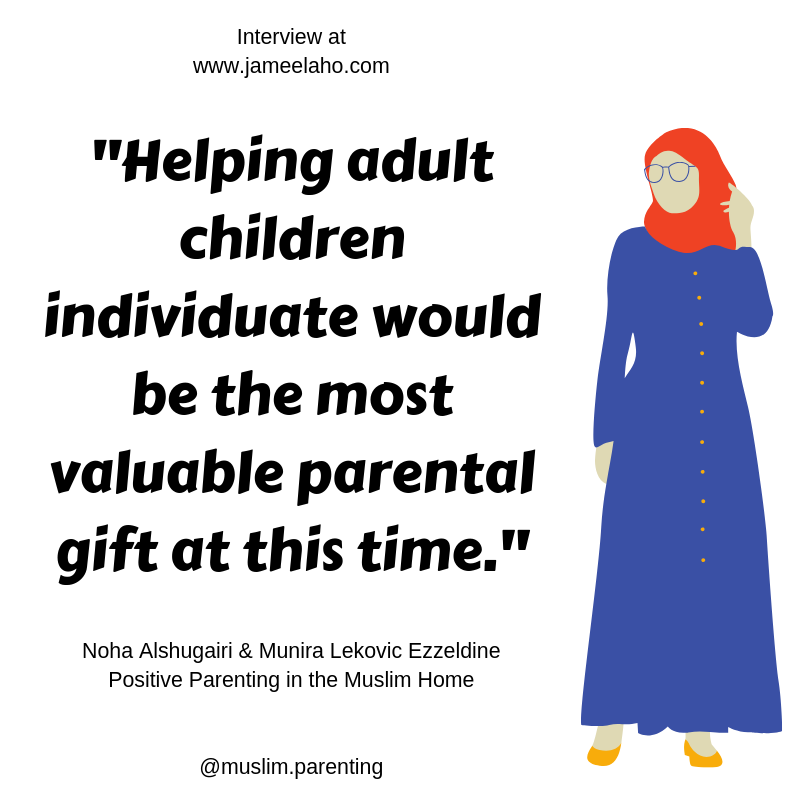 It’s actually an interview with the authors of ‘Positive Parenting in the Muslim Home’ – sisters Noha Alshugairi and Munira Lekovic Ezzeldine. This interview is full of practical advice that you can use right now to improve your parenting. The first obvious question is, how did the idea for your book Positive Parenting in the Muslim Home came about? As counselors, we know the direct impact that parenting styles have on a child’s wellbeing and we are passionate about educating Muslim parents with best practices. The idea for the book came when we realized the scarcity of relevant parenting books geared to Muslim families and we wanted to present a relatable book that would empower parents with practical tools. I (Munira) pitched the idea to Noha and we just began writing. After two years of writing, revising and editing we compiled this book as a labor of love. Before we delve any further, can you please explain what Positive Parenting is about for readers who are not sure what it is? Positive Parenting is an authoritative parenting style that is rooted in firmness and kindness. The positive parenting practices we outlined in the book were developed by the founder of Positive Discipline, Dr. Jane Nelsen, who incorporated the general principles of the Adlerian school of psychology into Positive Discipline. Positive Parenting is most in alignment with an Islamic approach to parenting as it is a holistic and intentional approach that addresses the development of a child through the relationships to key adults in the child’s life. The practical tools and strategies in Positive Parenting aim to build a strong parent-child relationship while teaching the child how to become an independent and responsible human being. I like the sound of that and I like having practical tools that parents can use. In your book you have 48 positive discipline tools mashaAllah. That’s a lot of helpful tools for parents! Could you describe for us your one favourite go-to tool and how you would use it? My (Munira’s) favorite go-to tool is Family Meetings. Our family has used family meetings since my children were 4 and 5 years old. Some of the best conversations have happened during our family meetings and I feel that each time we gather, we reaffirm our “we” mentality as we problem solve, plan and connect with one another. I also feel that family meetings have helped to establish our mutual respect because everyone has a turn to share thoughts and ideas. Family meetings have been a key tool in our family and I couldn’t imagine our family without them. The tool that changed the climate in my (Noha’s) house and saved me a lot of pain and anguish is listen. While I was always an understanding parent with my children, a workshop I took before my eldest enrolled in high school shifted my perspective. I truly thought that my kids have to just listen to whatever I said or stated. The workshop empowered me to understand that my children will have their own ideas and opinions about things and it is fine for us not to be on the same page. I learnt to hold my tongue and listen rather than prattle on and on. By listening I was able to see their worldview and have a better understanding of what they are thinking. This foundational piece of understanding was the first step in our ability as a family to come to solutions and resolve differences. I love these 2 tools! They’re so valuable for all families to have. And there are 46 others in the book! In Part III of your book, you’ve divided children into four categories: the early years, the middle years, the teen years and the adult children. What do you see as the essential characteristic of each stage and what one particular skill do parents need for each stage? In the early years, children are learning to trust the world and their family. The early years also are where children learn the basics of emotional regulation. Unfortunately, some parents dismiss the significance of these years thus losing a critical window into teaching life skills. Parents need to focus on teaching emotional regulation, respecting structure and routines, and providing appropriate experiences for children to believe in their capabilities in dealing with life. The middle years are considered the golden years of childhood-- if parents have established a solid foundation in the early years. For some parents, these years show the earliest signs of trouble to come. During these years, children are beginning to define themselves through their relationships whether at home or school. They are looking for clues as to what are they good at. During these years, parents are invited to expose children to a wide variety of extracurricular activities in addition to providing a safe space for children to nurture healthy peer friendships. The teen years are typically what parents complain about. However, if a solid foundation was established early on, these years become years of family synergy. Teens begin to prioritize their peer relationships over those of the family in their ongoing efforts to understand themselves. Some of them begin the journey of asking existential questions: Who am I? What connects me to others? Is what my parents preach valid? It becomes more critical to listen during these years than ever before. The best recommendations for parents during those years is to maintain family routines around dinner time, family time, and family vacations. Also it is helpful for parents to come up with plans to help themselves contain their anger and frustration around their teens. Understanding that teens seeking their friends during those years is not a personal abandonment of the parents is one of the most important gifts parents can give their teens. The main challenge of adult children is achieving individuation from their parents. That does not mean abandoning the family. It means the adult child understands and actively takes responsibility for his/her life. This includes providing for oneself and taking care of one’s needs on a daily basis. It is unfortunate that some Muslim parents do not grant their adult children that space until the latter are married. Helping adult children individuate would be the most valuable parental gift at that time. You’ve explained these stages so succinctly. I’m sure parents will find it useful. Let your spouse know you are practicing positive parenting and have found it to be helpful. Invite them to ask you questions when they like. Offer resources only when the spouse asks for them. Avoid nagging or putting down your spouse. Hold your tongue when you see your spouse doing something against positive parenting. Talk to your spouse in private when a situation arises. Let go of the need to convince your spouse of his/her wrong ways. Let your positive interactions with your children speak louder than your words. Be aware that there are some spouses who are not going to change. Do your part with your children and stop worrying about what the spouse is doing. Children are smart, they will work with you based on your style and with your spouse based on their style. When problems arise, talk to your spouse in private about the situation, be clear in what you will do, and focus on your area of control. For example, let’s assume your spouse allows your kids to have candy irresponsibly. Talk to your spouse explaining that you do not approve of giving the kids candy irresponsibly and that you will enforce this rule whenever the children are with you. This means that he/she cannot send the kids to you asking if they can have candy! The second reader’s question is in regards to motivating children who are just not self-motivated towards deen activities or even dunya-related things like studies etc. Parents have to push and push and push...but when the children do it, they don't do it with a cheerful and good attitude rather they do it resentfully and with dislike...how can we change this? This question is two parts. First part relates to pushing children to do things. In positive parenting we invite parents to avoid pushing. Yes, parents encourage and support but they do not need to push. Parents who were attending were skeptical. But a few weeks later I met one of the mothers who told me that she tried this approach and it worked. This stance will fail if the parent does not follow through. For example, it is 8:45 pm and the child begs to stay up to do homework and the parent relents despite the fact that child wasted time after school. Giving in when the rules have been clear, results in failure of structure and systems. When it comes to children following through on tasks it is critical that parents recognize what is the child’s responsibility (in this case doing homework) and what is the parent’s responsibility (in this case limiting access to electronics and establishing structures around bedtime and free time and then following through). The same applies to deen activities such as praying. The child’s responsibility is to do them. The parent’s responsibility is to teach, guide, and establish a system where prayers are done in Jamaa for example. Or the Azan is heard loudly across the household for everyone to know it is time to pray. Again, the one-time talk establishing the parameters of responsibility is important, “Praying is your responsibility. It is an important grounding practice for you that I hope and pray will become a life-long habit of yours. How can I help you practice regular prayers?” Again, the parent’s responsibility will be to nurture an environment where the children see their parents practicing the prayers and making them a priority in their daily lives. The second part of the question relates to the attitude of the child as he/she does something begrudgingly. Here our invitation is to simply to ignore the frustrating and annoying attitude and just compliment the child for following through on what was agreed upon. Remember that the priorities of children are definitely not aligned with the priorities of their parents. Thus, allow them the space to do things begrudgingly. The focus here is on teaching habits for life, not making convincing the child. The third question is, “How to encourage your husband to help out with the kids and around the house (without being mean about it)?” Do you have an answer to this from a positive parenting perspective? Begin by listing all home tasks; don’t leave anything out. Mark the ones that you would like to continue doing. Mark the ones you would like help with. Schedule a meeting with your spouse. Let him/her know the purpose of this meeting. Show your spouse your list of tasks and ask which tasks he/she would be willing to take on. If your spouse takes on some tasks, alhamdu Lellah. Leave these for him/her without any reminders or nagging. Allow the natural consequences of not doing the tasks be the reminder. If you personally cannot tolerate an unfinished task, reflect on what is more important to you: finishing the task or giving your spouse the space to do it on their own terms. If you finish the task for your spouse, recognize that you have moved the problem into your circle of control and thus your spouse is off the hook now. In some situations, the spouse may adamantly refuse to take on anything new. If that is the case, let your spouse know that you are tired and will think of a way to help yourself. I (Noha) have invited some of my female clients whose husbands refuse to help out to lean on friends and family for support and help. It is not ideal but when the spouse is non-collaborative, one has to be realistic and find other ways for support. May Allah Grant you all Qurat Ain in your spouses and your children. Ameen. This has been so valuable. You both have given us so much practical steps to take towards better parenting (and be a better spouse). Jazakillahu khayran for your time, knowledge and experience. 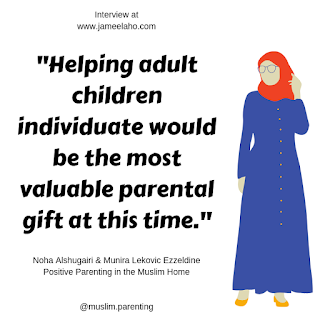 May Allah increase the good work that you do with parents and may your book ‘Positive Parenting in the Muslim Home’ be a guide in every Muslim household. Ameen. Parents, if you want to read more about Positive Parenting then please get this book. I’ve bought the digital copy (no, I didn’t get it free for reviewing) and I’m waiting for the physical book to be available in my local bookstore because I’ll buy that too to add to my favourite go-to parenting books collection. Love this! I'm studying child psychology and this would be a great read.